Electric buses are having a moment as falling battery costs make them increasingly competitive with diesel vehicles, and local and state clean air policies help drive deployment. 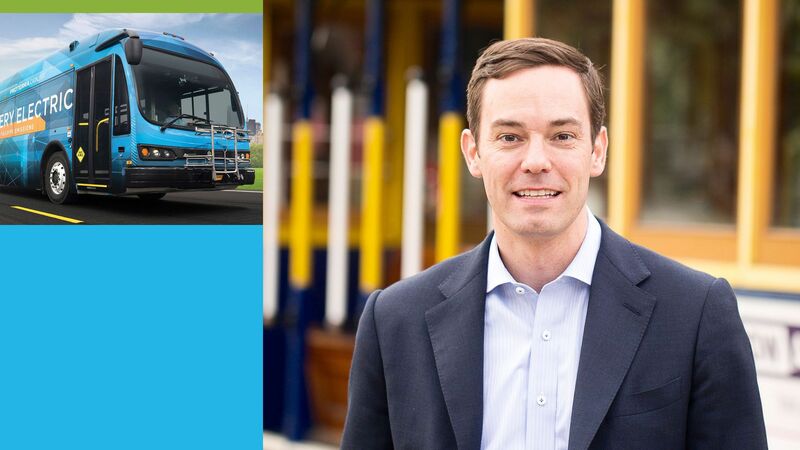 Driving the news: Major oil companies have approached electric bus maker Proterra — a heavyweight in the U.S. market with more than 300 buses delivered to cities and transit agencies and hundreds more on order — about investing in the company, but CEO Ryan Popple tells me he's steering clear for now. I sat down with Popple, who told me why he's skeptical of funding from Big Oil, regions where the company is eyeing possible expansion in the future, and the opportunities beyond buses. Battery costs: Popple said battery costs when he became CEO in 2014 were 4-5 times higher than they are today. That improvement rate won't continue now that they're in the $200s per kilowatt-hour range, he said, predicting annual cost declines the single digit percent in the next few years. But that steep downward slope of recent years doesn't need to continue. “The breakthrough on battery costs already happened,” Popple said. Going forward, a greater amount of bus price reductions will come from production scale and improvements in non-battery parts of the buses. “Ultimately our goal is to get the bus to parity with the diesel bus, not on a TCO [total cost of ownership], on an up-front basis,” Popple says. “I don’t think we’ll ever get all the way there, because I actually think that once we’re within a 2-year fuel payback, the diesel bus market goes extinct,” he adds, referring to the idea that the higher up-front cost of the e-bus is made up within 2 years. He predicts that a tipping point will be when e-buses are down to $100,000 more than a diesel bus in up-front costs. Expansion: The company entered the Canadian bus market last year and also sells battery packs to Europe, but Popple says attempts to compete head-on in Europe against legacy automakers would not make sense. “I would not enter the European market with a Proterra product,” said Popple, whose investors include Daimler and BMW. Emerging markets: Popple is cautiously thinking about emerging market economies, including Latin America and India — places he envisions Proterra potentially teaming up with home-country partners. “They are growing like gangbusters, they tend to want to skip the legacy technology, they tend to be more concerned about climate change than we are, unfortunately, at a federal level," he says of emerging economies. Yes, but: Popple wants to avoid "biting off more than we could chew and then screwing it up." And he rules out China, which has the world's largest e-bus penetration, over concerns about protecting his company's intellectual property. Big Oil: Popple revealed that the venture capital arms of major oil companies have made preliminary inquiries about investing in Proterra, which has raised over a half-billion dollars overall, including a $155 million round closed last September. Popple credits oil majors for making more moves on climate change recently, but he remains wary. “I would be worried to really disclose what we are up to, what our strategy is, to an oil major until you really see shareholders and boards of directors state that, all right, this is our carbon budget for the next 25 years, we are going to ride out oil, but we are going to actively invest in the energy transition,” he says. Technology: Proterra, in partnership with Daimler, recently made its first foray into the U.S. school bus market. They're also exploring ways to electrify other types of Daimler's heavy duty vehicles. “Generally our conclusion is, whether it is Daimler or someone else, there is almost no limit in terms of the commercial vehicle applications you can go into, and some of it is even beyond the stuff that Daimler makes, if you think about mining equipment, construction, agriculture,” he says. “Basically, anything that is a depot-based vehicle that burns a lot of diesel a year I think is somewhere in the adoption curve of going electric." But, but, but: Popple says he doesn't want to take his eye off the ball. “Even with all those other exciting opportunities, I’d say we probably still have to keep 80 to 90 percent of our attention on driving the wedge all the way into the city bus market."